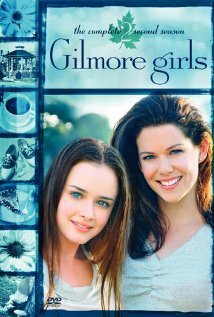 The story revolves around Lorelai Gilmore, a thitry-something single mother, and her daughter Rory, both living in a small town called Star Hollow, in Connecticut. Lorelai got pregnant when she was only sixteen and chose not to marry the father, which guaranteed her not only lots of work, but her familiy’s permanent dissaproval. Fortunately for her, the relationship with her daughter and the other inhabitants of the town make up for any hardships. In fact, both women get along so well that people often mistake them for sisters, and some times their dialogs are more akin to siblings’ chat than the typical mother-daughter conversation. While some may find Gilmore Girls too sugary, it’s hard to deny that it’s a charming, well-written show. The chemistry of the two lead actresses is very good, and they really give the show the familiar air it needs to be believable. Snappy dialogs and fun situations make for an enjoyable, rarely dull view. As with any show with very young actors that lasts for a long time, one of the interesting parts is watching them grow and develop. And Ms. Alexis Bledel, the actress playing Rory, grows up a lot through the series. When the story starts, her character is only 15 (though in reality she was 18), and by the end she’s turned into a beautiful woman of 22. Though the show is clearly aimed to a female demographic, it can be enjoyed by anyone interested in parent-children relationships and costumbrist stories. Besides the two leads, the large, ensemble cast, gets to create a charming “small town” atmosphere and making the audience care about their stories. So if you liked Northern Exposure o Everwood, you’ definitely want to take a look at this one. 12 November 2002 - Season 3, Episode 7: They Shoot Gilmores, Don't They? 29 April 2003 - Season 3, Episode 19: Keg! Max! 14 October 2003 - Season 4, Episode 4: Chicken or Beef? 20 April 2004 - Season 4, Episode 18: Tick, Tick, Tick, Boom! 19 October 2004 - Season 5, Episode 5: We Got Us a Pippi Virgin! 26 October 2004 - Season 5, Episode 6: Norman Mailer, I'm Pregnant! 03 May 2005 - Season 5, Episode 20: How Many Kropogs to Cape Cod? 22 November 2005 - Season 6, Episode 10: He's Slippin’ ‘Em Bread... Dig? 07 November 2006 - Season 7, Episode 6: Go, Bulldogs! 28 November 2006 - Season 7, Episode 9: Knit, People, Knit! 27 February 2007 - Season 7, Episode 16: Will You Be My Lorelai Gilmore? 01 May 2007 - Season 7, Episode 20: Lorelai? Lorelai?